Donna Chisholm is both a teacher and an artist. With over 20 years in the Early Childhood arena, Donna has an interesting perspective around how young children interact with Papatūānuku (Mother Earth). Her father (one of her biggest influences), has a simple ethos. “You learn everything you need to know in nature”. This has allowed her to look, observe, consider and think deeply. As active researchers, children reveal great knowledge and wisdom when supported in an outdoor environment. With the introduction of OSH (Occupational Health and Safety) the implications on children’s learning has been huge. Donna wonders if the creative, divergent #8 wire mentality of most Kiwis’ isn’t being nurtured in young children today due to the focus on regulations, risk and safety. It is a privilege to watch, and to hear a more reasoned voice in Celia Hogan, who advocates for children to interact with the great outdoors, which, is our immediate back door. Thank you to our guest blogger Donna for taking the time to share her experiences and thoughts. I spent time in the great outdoors. I had consistently unstructured time in nature. Be it the bush, at the river, by the sea. My parents were nearby, Big Daddy with his fishing and Mumbo in her garden. Days were long. Sandwiches were marmite and cheese. Tea was strong. Dinner was fish which melted in your mouth, coupled with salad greens rinsed half an hour before eating. My childhood sounds romantic. Simple. Quintessentially kiwi. Fast forward forty years and I begin to notice that some kiwi kids access nature under the watchful eye of an adult. Time is managed. Structured with events, preschool, classes which range from music, dancing, book listening. Where is that tinkering time? The blissful recharge of lying in nature staring into the sky? The unstructured time where problem solving and community became the priority? If my parents were busy, then ‘who’ or ‘what’ became my focus. How could I find (or problem solve) a bridge for that time? Nature. Challenge. Risk. Neighbourhood friends. I grew up with childhood friends who indulged my creative ideas. Who also suggested suitably crazy ideas. Often crime and pioneering concepts fuelled out days. We were challenged with sincere first world problems. ‘How can we snafu those preserved pears unnoticed, so we can transport them to our newly made ‘bomb shelter’?’ Couple this with the underground mazes and slides we found in the hay shed. The fierce competition between us. Watching who was climbing up the fastest and then finding a ‘new’ way out. Not once do I recall someone observing me, shouting across the paddock to ‘be careful’. Recently I have been able to take two fellow pioneering spirits to the Margaret Mahy playground. These two commonly refer to it as the ‘Fun Park’. And it is. Not just for them. But for me too! Master 4 observes wonders and challenges himself. He is confident and secure at the physical skills he has. He begins with the vertical slide and gleefully runs ahead to get his first ‘zoom’ in. Not too far behind is Ms 2. Her brother is a powerful role model. She too takes confident steps at the challenges presented. After a morning here all the other local playgrounds pale in comparison. After a morning here, I notice a trend. Adults who manage the ‘risk’ and ‘safety’. For the children. 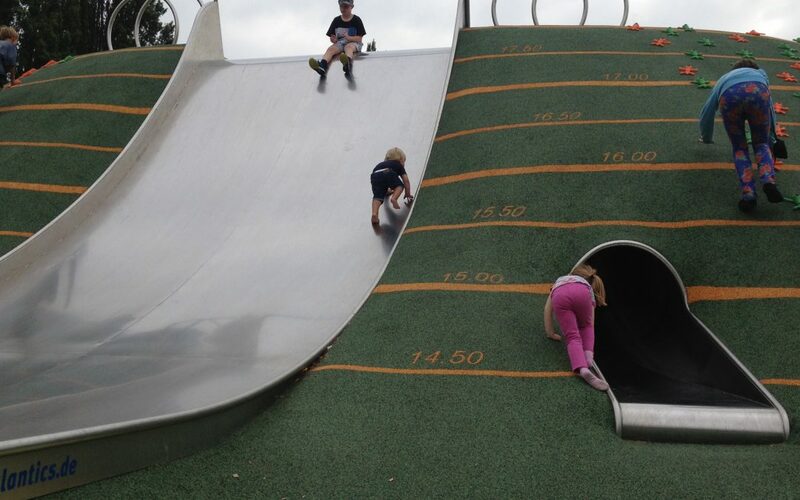 I over hear adults at the top of the ‘big slide’. “How old are you?” “Are you safe here?” “Can you do this?” “Where’s your Mum or Dad?” I listen from the bottom. I wait. Ms. 2 takes her time. She climbs consistently and focus’ on the prize at the end. No sooner is she down, she begins running to one of entry points so that she can begin her climb up, again. Adults at the bottom look around. Stunned. Or is that a mask of worry? One lady moves to me and says ‘he’s a handful’. I smile and say ‘No. She’s a focused learner who is learning about how to move’. Sometimes the adult begins a conversation. Other times they move away with a worried look in their eyes. Master 4 and Ms 2 are the children of Celia Hogan. The founder of Little Kiwis Nature Play. The ethos is simple yet powerful. Together we wonder at how children access and interact with New Zealand’s early year’s environments. Environments which have larger carparks than outdoor play areas. How children may spend time with adults who check for safety and check in with ‘be careful’. 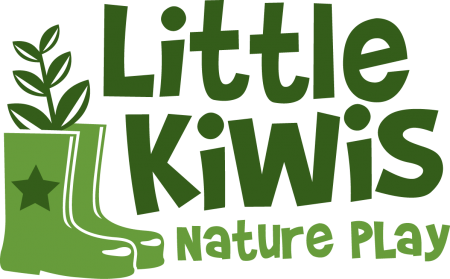 Little Kiwis Nature Play embraces the great outdoors as one of the most powerful teachers in a person’s life. As Celia shares her ideas and concepts for children in NZ I nod and agree. How could I not? What she talks and shares is exactly my childhood experience. Well written Donna. I too had the same upbringing on the West Coast (south Island) and we came home form bush/road play when it was time for tea. We always played with a group of kids as there were some big families in our little town, the older ones keeping an eye on us little ones, and us little ones following in their footsteps. Osh today would have kittens, sometimes it’s just best not to watch! We are all still alive. I totally agree with this concept. Having lived on a farm during my childhood, there are memories of a careless freedom to explore the things that most children these days don’t get to experience. Tree-climbing, dam-building, making huts in the trees and bushes, bird-nesting ; all the things that go with living on a farm. Nature was so intriguing and led to a natural curiosity about insects, animals and plants, simply because they were there. We were never told to “be careful” and inevitably we had accidents and broken bones but that for taken for granted. We learned, sometimes painfully, that things did happen if we took risks but mostly not “bad”things. It taught us what to avoid and what was safe. How else do we learn these things, if not through childhood experiences?